Our findings show that, for the most part, in the minds of camp administrators, Hebrew usage at camp is not about developing proficiency in spoken Hebrew. Rather, it is a vehicle for nurturing feelings of belonging to the camp community and the broader Jewish community, as well as connection to Jewish sacred texts, Israel, and the Jewish people. We asked respondents to rate the importance of 15 educational goals that a Jewish camp might have, of which seven were related to Hebrew. We found that Hebrew goals rank much lower in importance than goals such as enhancing personal Jewish identity and strengthening connection to the State of Israel. Among the Hebrew goals, those regarding feeling connected and being exposed to Hebrew ranked much higher than those related to Hebrew proficiency. More specifically, promoting knowledge of Hebrew prayers, songs, and select words and strengthening campers’ emotional attachments to Hebrew were more important than strengthening their ability to speak or read Modern Hebrew or to read Biblical or Rabbinic Hebrew. In addition to understanding the “why,” we also want to understand the “how” – findings from which are especially beneficial to the broader field of Jewish education. How do camps foster connection to Hebrew? It depends on the camp. Some camps perform Hebrew word skits, give Hebrew names to divisions, locations, and activities, and use phrases like boker tov (good morning), sheket b’vakasha (quiet please), and chadar ochel (dining room). A few camps even offer classes or immersion programs with the goal of proficiency. Camps that have more Hebrew practices also tend to have staff with more Modern Hebrew language knowledge, more Israeli shlichim (emissaries), and a primary goal of fostering campers’ connection to Israel. The camp networks with the most Hebrew practices are Ramah, Young Judaea, Bnei Akiva, and Habonim Dror. Many independent, pluralistic camps and those affiliated with the JCC Association engage in few or none of these practices, but they do sing Hebrew songs and prayers/blessings and use Jewish life words like Shabbat shalom and tikkun olam. Aside from Bnei Akiva camps, most Orthodox camps only use Hebrew in prayers and songs, decorative placards with liturgical quotes, and Jewish life words like tefillah and Birkat Hamazon. As this diversity indicates, Hebrew is one of the many elements that give each camp its own unique character and allow it to define its understanding of Jewishness in North America. The diversity in Hebrew practices shows that Jewishness at camps has multiple meanings as Hebrew practices are associated to varying degrees with Israel, religious observance, social activism, and/or spirituality. Despite (or perhaps because of) this great diversity, our survey reveals that Hebrew serves as a common denominator. We did not find any Jewish-identified camps that have no Hebrew at all; even the most secular camps have at least a few Hebrew songs or words. No matter which Jewish summer camp children attend, they will likely come away with the message that Hebrew is a part of Jewish life. What can camp staff, Jewish educators, and policy makers take away from our study? First, because Hebrew is one of the tools camps use to foster Jewish belonging, it behooves us to be more intentional about how Hebrew-imbuing activities can be conceptualized and professionalized. Camps and umbrella organizations might devote (more) attention to who is responsible for this effort and how this knowledge gets passed down over time and across different camps. Second, in an age of polarization, Hebrew can be more purposefully used as a tool for promoting Jewish unity and cultural vitality. When Hebrew is infused into the camp’s soundscape and visual landscape, it inspires cultural expression and serves as a group marker, conferring insider status even as it sidesteps potentially divisive religious or ideological differences. Our findings raise questions about how the Hebrew practices at camp can be incorporated into Jewish educational activities in other Jewish communal settings, such as synagogues, JCCs, and religious schools. The survey results show that Hebrew infusion gets a big bang for its buck. Without much commitment of time or resources, staff members can incorporate Hebrew words, signs, skits, and songs. While some educational institutions have enough instructional hours to offer Hebrew immersion and other programs that lead to students’ fluency, others simply do not. When Hebrew proficiency is not an attainable goal, educators can look to camps for other ways of approaching Hebrew. Hebrew infusion can lead to strengthened Jewish connections and communities. Hebrew camps, (as well as supplementary schools, stateside Ulpanim and other Hebrew offerings) can do a much better job ‘imbuing’ Hebrew in their summer programs, IF that’s really their goal. 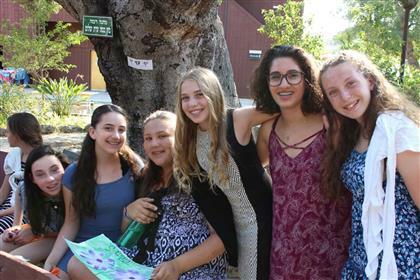 Jewish summer camps don’t have to choose between ‘nurturing feelings of belonging’ and steps toward Hebrew proficiency; they can successfully offer both! The first key step towards improving proficiency outcomes for their campers is educating camp staff/faculty in Second Language Acquisition, which is the bread and butter of teaching another language, as well as training educators/counselors in best practices for acquisition. I’ve trained my first small group of teachers – it is pleasant and effective! World Language instruction has experienced a revolution in instructional strategies, which are often loosely referred to as ‘Teaching with Comprehensible Input. (T/CI)’ These practices are playful, collaborative, aligned with brain research, and perfect for a fun, laid-back camp setting, as they often incorporate made-up stories, drama, costumes & props, and may also integrate music, video, pictures and other media. Teaching with Comprehensible Input (T/CI) is NOT immersion (immersion denotes content instruction, i.e., history or science, and longer periods of exposure, say several hours per day), though CI classes are 90+% in Hebrew. The distinguishing feature is that the CI sessions are comprehensible – all learners understand the language spoken in the session (here’s where teacher training is crucial); compelling – the topics of conversation are based on student/group interest and ideas; and contextualized (not hard with a tight community of friends at a Jewish camp). I’m trying to educate our wider Hebrew educator community about best practice language instruction strategies so that we can offer enjoyable and effective Hebrew programming to our kids and everyone else, too!